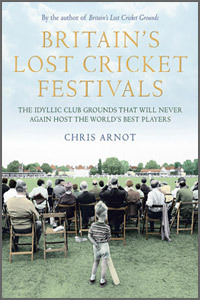 Following on from his Britain's Lost Cricket Grounds, Chris Arnot has produced another marvellous book reminiscing about yesteryear when counties regularly put aside time during the summer season to put on a festival at lesser-known grounds. Nowadays, sadly, few counties want to take their sides away from their main grounds many of which have been refurbished in the last few years. What is so nice about this book are not only the reminiscences and history of these grounds but the wealth of photographs which will act as a wonderful reminder of some of these lesser-known but characterful grounds and some of the legendary cricketers who played there. Reading this book brought back many happy memories of grounds where I have been fortunate to watch, score and – at a minor level – even play. Eighteen counties have their out-grounds mentioned in this lavishly illustrated and entertainingly-written book. Lovely to read about and remember but also sad that there are so few festivals held these days and it is much to Gloucestershire's credit that they maintain their festival at the delightful Cheltenham ground. Some of the photographs date back to the early twentieth century and, whilst I suspect that there may be a couple of typing mistakes in the captions, the wealth of photographs makes this a most interesting memoir. Chris Arnot has proved himself to be a very flexible writer and his other books include, outside of cricket, books on Britain's Lost Mines, Britain's Lost Breweries and also football grounds, he has proved that he has a wide range of interests and we should be grateful that, in Britain's Lost Cricket Festivals, cherished memories for doubtless many cricketers and supporters will never be forgotten. Anyone wishing to remember days long gone from Abergavenny to Woksop through Frome and Oakham School, should find this book a true gem and go and buy it.